VANCOUVER, BRITISH COLUMBIA--(Marketwired - Oct. 28, 2014) - Forum Uranium Corp. (TSX VENTURE:FDC) is pleased to announce results of exploration on the North Thelon project, Nunavut. Mapping, prospecting and sampling were completed this summer in selected areas of economic interest on its strategic landholdings on trend from AREVA's 133 million pound Kiggavik uranium mine development project. In a news release dated October 2, 2014, AREVA announced filing of the final environmental impact statement for its Kiggavik project to the Nunavut Impact Review Board. Located 80 kilometres west of Baker Lake, the Kiggavik project is a proposed mining and milling operation owned by AREVA (64.8%), JCU (Canada) Exploration Co. Ltd. (33.5%) and DAEWOO Corporation (1.7%). Pyro South, an area along the AREVA boundary that also hosts historic uranium showings. A total of 25 basement and sandstone rock samples were collected and shipped to the Saskatchewan Research Council for geochemical analysis. A new showing at Long Lake returned outcrop and boulder geochemistry with values from 34 to 128ppm U being returned, with associated elements of boron (up to 626ppm), lead (219ppm) and nickel (278ppm) in 'dirty' metaquartzites, the same rock type that hosts the Kiggavik deposit. Values of up to 98ppm U were returned from arkosic boulders in the BL-32 area. Forum Uranium continues to view this project as an important and strategic part of its portfolio due to its immediate proximity to AREVA's Kiggavik uranium project and Cameco's Turqavik and Aberdeen projects. AREVA Resources Canada Ltd has completed engineering, environmental and public engagement studies for the development of an 8 million pound per year (approx.) uranium mine that would require three to four years of construction, followed by approximately fourteen years of operation. Cameco Corp. has intersected uranium with grades of up to 3.52% U3O8 over 10 metres along the Andrew Lake fault which extends onto Forum ground both to the east and west. 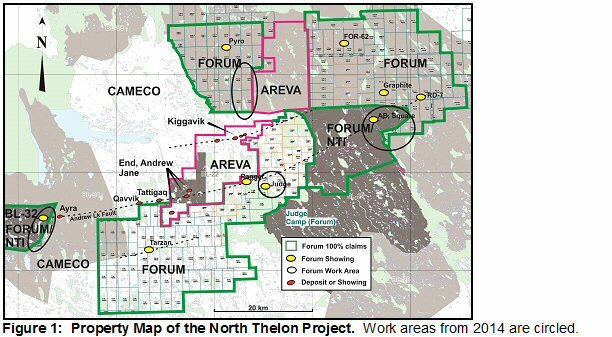 Forum acquired a large (>419,000 hectares), strategic land position in 2006 surrounding the AREVA/JCU (Canada)/DAEWOO world-class Kiggavik mine development project. Forum now has 198,000 hectares though its 100% interests in mineral claims and its rights to earn 100% interest in Inuit owned land parcels BL-21 and BL-32 from Nunavut Tunngavik Incorporated (NTI). The 133 million pound Kiggavik uranium project at an average grade of 0.54% U3O8 has undergone engineering, environmental and public consultation studies and an Environmental Impact Statement has been submitted to the Nunavut Impact Review Board. The proposed mine anticipates production of approximately 8 million pounds of uranium per year. Cameco has been actively exploring its property to the west of AREVA since 2005 and has announced three discoveries. Ken Wheatley, P.Geo. (Saskatchewan and Nunavut), Forum's Vice President of Exploration and qualified person has reviewed the contents of this news release. Forum Uranium Corp. is a Canadian-based energy company with a focus on the acquisition, exploration and development of Canadian uranium and rare earth projects. Forum has assembled a highly experienced team of exploration professionals with a track record of mine discoveries for unconformity-style uranium deposits in Canada. The Company has a strategy to discover near surface uranium deposits nearby existing infrastructure by exploring on its 100% owned properties and through strategic partnerships and joint ventures.